Australian Shepherds are a popular choice among dog owners for many reasons. They are friendly, energetic, and have beautiful, speckled markings. They’re fluffy as puppies, and grow into adorable wolf-like dogs as adults. In short, they are stunning. Although appearance shouldn’t be the basis of the decision to adopt, many times it is. This is one of the reasons it’s common to see breeds like the Australian Shepherd up for adoption. Well-meaning people often forgo breed research and assume herding dogs will be happy living the same lifestyle as other, mellower breeds. The truth is that every breed is different. Before committing to anything, it’s important to consider the specific needs of the breed and the type of lifestyle they require. Australian Shepherds, or Aussies, are herding dogs at heart. That means they’ve been bred to work and get great satisfaction out of doing so. Aussies need constant stimulation and plenty of exercise to stay happy and healthy. In addition to 30-60 minutes of exercise per day, Aussies greatly benefit from enrichment, such as competing in herding agility courses. For this reason, they’re not suitable for apartment life, and should have adequate space outdoors to roam and play. Aussies are intelligent, affectionate, good-natured, and protective. They learn quickly and get along great with kids, making them an excellent family pet. Aussies must be socialized from a young age so that they learn the proper way to interact with children. It’s natural for Aussies to want to try and “herd” kids, but this behavior can easily be corrected with the proper training. Australian Shepherds are loyal to their family and enjoy the company of their people. With proper exercise and mental stimulation, they thrive in a family environment. Because they are so intelligent and eager to learn, Australian Shepherds are great candidates for being trained as therapy dogs, Seeing Eye dogs, or even to work with law enforcement. They excel as search and rescue dogs, and can even be trained to help you with chores around the house! Aussies are extremely versatile and are eager to help wherever they can—especially if it means making you happy. Australian Shepherds are not destructive by nature, but left alone, they can develop destructive behaviors. Without a purpose or a job to keep busy with, Aussies can turn to other, less desirable behaviors to satisfy their boredom. Long, daytime hours spent alone are not ideal for this breed. Whether or not you have a certain breed of dog or cat in mind when browsing available pets, it’s good to have an idea of what you can expect when the time comes to adopt. You should have an idea of the energy level, exercise needs, adaptability, and sensitivity of the breed to avoid any surprises down the road. 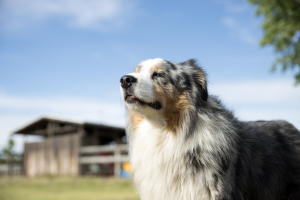 For more information about the Australian Shepherd, check out this comprehensive article.